One of the more intriguing finds of the past couple of weeks has been the fragments (referred to collectively as the “vessel cluster”) of a Kaolin clay tobacco pipe unearthed while excavating Block 6, the hospital block (Figure 1). Kaolin, a soft, white mineral, was first mined centuries ago in China, and used as an ingredient in china and porcelain. The clay began to appear in Europe in the early 1700’s, where it found its way into the manufacture of the relatively inexpensive pipes that today bear its name. We know that, in his haste to meet the construction timetable of less than four months from mid-November 1861 until February 1, 1862, the prison construction contractor utilized freshly cut and unseasoned wood. As wood ages over time and begins to lose its moisture, individual boards are subject to shrinkage. This can result in gaps appearing between boards – such as those used to construct the floor of hospital Block 6 – as well as cause knot holes to appear, as the knot shrinks and finally drops out of the board. Based on this, one possibility for how the fragments ended up under the building is that the pipe was dropped onto the floor of the hospital, shattered, and the resulting pieces were later swept through the nearest floor board gap, or large knot hole, during cleanup. Another possibility is that the pipe belonged to one of the workers involved in the dismantling of the block buildings immediately after the war, someone who perhaps lost it out of his pocket as he was removing the lumber. Speculation aside, we will likely never know for certain who owned the pipe, nor how it came to end up in pieces buried under layers of earth, only to be uncovered again by the flick of our trowel almost one hundred and fifty years later. All we can do is return it as close as possible to its original condition, ever mindful of the incredible journey it endured on its was to our laboratory. 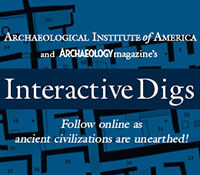 Having been recorded and bagged at the field site, the thirteen fragments that were once part of a fully functioning kaolin clay pipe were brought to the Heidelberg University archeology laboratory. Initial examination of the bowl fragments by Juli, Phil, and Dr. Bush (Figure 2) revealed clearly visible signs of carbon residue, indicating that the pipe had been used. 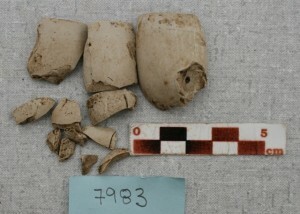 Also visible was the stem hole; the stem itself was not among the recovered fragments, however (Figure 3). Recognizing that sizable portions of the pipe bowl had been recovered, and using the carbon residue as a guide, our team began the process of piecing together the individual fragments that made up the vessel cluster. As is the case with any good jigsaw puzzle, much trial and error ensued, with the goal being that, in the end, all of the fragments would find a “home.” In this we were lucky, as we discovered when we finished our “dry” ( i.e., unglued) assembly, and the specimen tray of fragments was empty (Figure 4). Having figured out which pieces went where, the only remaining step was the actual gluing process. For this we used polyvinyl acetate (PVA), a clear-drying adhesive that is particularly effective on porous materials such as clay. PVA is brushed onto the edge of one half, and then pressed against the other until the adhesive sets (Figures 5 & 6). One after another, each of the fragments were glued into their original place, until the finished pipe emerged from what before had been simply a plastic bag of disassociated parts (Figure 7). And with that, “Kaolin Clay Tobacco Pipe, Field Specimen #7983”, took its place among the almost eight thousand specimens that preceded it, and we returned to the site, trowels in hand, to unearth the next mystery. This entry was posted on Sunday, July 5, 2009 at 6:00 am	and is filed under Special Finds. You can follow any responses to this entry through the RSS 2.0 feed. Both comments and pings are currently closed. I just found this website recently when a buddy of mine recommended it to me. I’ve been an avid reader ever since.